"No I'm not! You're dead!" "But I shot you first . . ."
Et cetera. The thing to remember about this argument is that it is conducted in terms of total fantasy. Neither kid believes his victim is dead. You fight these battles with your personality. When the other kid temporarily agrees to be dead, it is a victory for your own superior force of will. Also, of course, you might punch him in the nose. Exactly the same principle works in the movies. When all that lead is flying around, the only reason John Wayne doesn't get hit is because he is morally superior to his enemies. Not only doesn't the hero get hit, the bad guy doesn't die. Not really. He grabs his shoulder and shouts "aargh!" and staggers around and falls and lies still. But he doesn't die, any more than the little kids on my block die when the big kids shout, "You're dead." The bad guy doesn't die; he simply agrees to be shot and to lie down in surrender to the superior moral force of the good guy. The bad guy's real punishment, see, is that he can't be in the movie any more. The movie begins with about three times as many good guys as bad guys, but it ends with no bad guys at all (except maybe a few in jail). The good guy lasts until the end of the movie. It is exactly the same in street games; once you're dead -- you can't play anymore. All you can do is lie there, disgusted, while everyone else races around the side of the house. So when you go to see a Western, you identify with the good guy and you last. You cheer when the bad guys get it, because they aren't you. You're John Wayne. These thoughts, so far, have been inspired by a visit to the Chicago Theater to see Sam Peckinpah's "The Wild Bunch" once again. It has become this year's controversial film about violence, the successor to "The Dirty Dozen," "Bonnie and Clyde" and the Italian Westerns. It is also, many critics agree, an extraordinary film. In an article published a month ago, I described it as "an important act of filmmaking," and said the film "presents death and violence in such definitive (indeed, even excessive) terms that it becomes, paradoxically, a statement against violence and a reaction to it." This has been my critical line for some time; I used the same reasoning in defending "Bonnie and Clyde." I think the argument is valid with "Bonnie and Clyde," but that it doesn't fit "The Wild Bunch." This year's movie has to be considered in fresh terms from last year's; society has changed, movies have changed, there have been advances in the philosophy of violence. So I went to see "The Wild Bunch" again, this time not at a reverent screening but with a typical weekend Loop audience. And I learned a thing or two, I believe. Or remembered them. Consider for a moment the various strategies in the controversy over violence in the movies. When a particularly violent film like "The Wild Bunch" comes along, there are usually three stages to the critical reaction. First, the film is attacked for its excessive violence. Second, it is defended by its admirers as a statement against violence. The excess of violence, it is argued, causes a reaction in the audience; the movie fights violence like an inoculation fights smallpox. The third critical stage comes when a critic actually attends the theater where the movie is showing. He returns horrified. The audience, he reports, was cheering and applauding and laughing; far from being revolted by the excessive violence, the audience loved it. What went wrong? One Chicago critic was so shocked by his visit to the theater that he suggested members of the audience might be in need of psychiatric help. I have a general theory, that audiences know what they're up to. If they laugh at violence, it is probably more useful to examine the violence than to psychoanalyze the audience. In the case of "The Wild Bunch," this is particularly true. Let me admit to heresy: I enjoyed the violence, too. I suppose "The Wild Bunch" is the most violent movie ever made. Hundreds of men, women and horses are slaughtered. A man is dragged behind a horse. Throats are slit, broken, strangled. Blood flows in an unending stream. Thanks to recent advances in special effects, the blood actually spurts when somebody gets shot; there are geysers of blood everywhere. A friend of mine describes "The Wild Bunch" as being 200 simultaneous blood transfusions with no recipients. So how could I possibly enjoy this bloodbath? Because it was no more real than the dozens of gunfights I have already survived, in the company of Rex Allen, Hopalong Cassidy and John Wayne. I am aware that the shootings in "The Wild Bunch" are the most realistic ever filmed. But realism is not the same thing as reality. The wounds look terribly real in "The Wild Bunch," yes, but it is impossible to forget that this is a movie. Indeed, the extreme realism of "The Wild Bunch" actually reminds you that it's a movie. This is a curious phenomenon. The most effective deaths in movies are stylized ones by well-rounded fictional characters. At the end of "Of Mice And Men," Burgess Meredith describes the marvelous farm somewhere "out there," which he and his friend Lon Chaney Jr. will someday own. While he describes this vision, he presses his gun to the back of his pal's head and (as we see Meredith in close-up) pulls the trigger. This is a frankly literary scene; there's no "realism" to it. But it has a deeply emotional effect on audiences. That's because a carefully developed character, one we have come to know, has gotten trapped in an impossible situation and has to die. We lament the death of the character; not the death of the actor. The same is true when Ratso dies in "Midnight Cowboy," and when Bonnie and Clyde are ambushed. "The Wild Bunch" does not provide this kind of death until the very end, when credibility has already been lost. 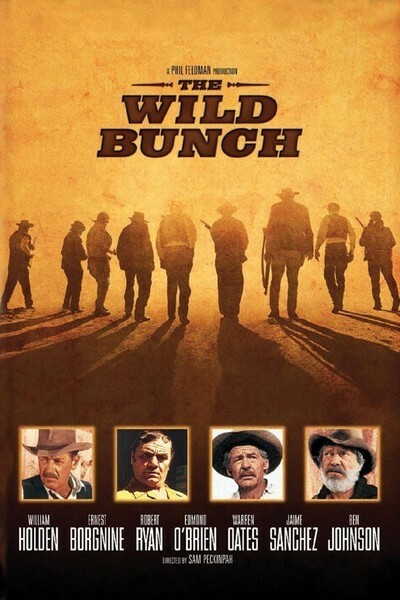 The hundreds of victims in "The Wild Bunch" are not characters but actors -- stunt men, extras, stand-ins. They have no identity. Their function, for the most part, is to appear on the screen, be shot and die. After each series of deaths, we cut back to the men with the guns, or at the end to William Holden with his machine-gun. The scenes that result are not really death scenes (for death comes to individuals, not to crowds). Nor are these really scenes of violence (although violence is the motif). They are, in fact, scenes of power, in which the man with the gun is in control. We identify with this man, we identify with Holden as one day we identified with Gene Autry, and we enjoy these scenes simply because they give us a vicarious sense of power. This may not be a noble emotion or a pure one, but it is honest and human enough. And that blood. In the article a month ago, I wrote that Peckinpah "shows the face of violence rather than the comic strip substitute supplied by most Westerns." This is incorrect. The deaths in "The Wild Bunch," I now believe, are no more real than the deaths suffered by those villains of the late 1940s who used to clap their hands to their shoulders and holler "aaargh." The deaths in "The Wild Bunch," indeed, are no more real than when the big kids on my block shout "you're dead" and the little kids fall over. This sort of dying is fundamentally different from Ratso's death, for example. Ratso was the subject; the hundreds of victims in "The Wild Bunch" are direct objects. Their deaths are not the point; it is William Holden's mastery over them that is the point, and in dying they simply oblige him. The technology of special effects can provide a lot of spurting blood, but it cannot make this sort of one dimensional death any more real. What we are left with, then, is a very good Western with very good performances, and several well-directed scenes of violence during which we can come to terms with whatever needs we carry in our hearts. There aren't many people, I suppose, who didn't rejoice when Gary Cooper found a noble and usually brave way to shoot an enemy. But in "The Wild Bunch" there are no heroes; only some bad guys we know killing some bad guys we don't know. We cannot identify quite so conveniently with William Holden, Ernest Borgnine, et al. At least not publicly. And so it is a temptation to deplore audiences which cheer Holden's final mopping-up exercise. But remember this: At that point in the movie, Holden is all we've got. We know him, we rather like him. Aren't we kidding ourselves if we deplore Holden's wholesale murder with the machine gun, and yet defend the noble Cooper, the brave Wayne, and good old Hoppy? Since the sort of death in "The Wild Bunch" isn't the death of actual characters, does it matter how many cardboard targets are knocked over in the shooting gallery?